It’s fair to say that 2017 has been Seren Winds’ busiest year yet! After our successful audition for ‘Live Music Now’ in April, a celebratory curry was followed by training days in May, June and July with the five other acts joining the scheme. It was good to see both familiar and new faces and to see such a diverse range of musicians. Training was delivered by Dan Perkin who gave us an overview of what to expect, Julian West who raised our awareness of Dementia and Ros Hawley who gave us practical guidance on how to work with SEND pupils. The sessions were insightful and interesting and we were very grateful for their guidance and expertise. We played our first LMN gigs on July 18th, traveling to Trinity Fields Special School in Ystrad Mynach where we gave our concert during the school’s morning break time. Despite the challenge of playing outdoors, lots of the pupils participated with some good conducting and chanting along, even in 7/8 time. We then gave an afternoon performance in a care home in Caerphilly, where we received a very warm welcome, in both senses of the word! September 21st and 22nd saw two school performances. A very lively audience at Court Special School made for lots of participation from both children and adults alike, and it was lovely to see parents joining in too. The Hollies School in Pentwyn provided us with one of our largest audiences of autistic children to date, comprising around 90 children and 50 carers. We had an amazing response from them: the children were significantly more engaged than a usual assembly, and despite noise levels in the hall being fairly loud, it was the quietest the staff had heard them! We were very impressed by their participation; one pupil knew all the instrument names and did a great job conducting, particularly enjoying controlling the dynamics of the quintet. It was lovely to have such positive feedback and we are hoping to make a return visit to the school in the future. October 11th was our first visit to The Grand Pavilion in Porthcawl. We enjoyed playing an exciting and varied programme, including firm favourites Poulenc Novelette in C, Calvin Kleztet and also premiered Michael’s arrangement of Bernstein’s Overture to Candide. October also saw National Egg Day – who knew?! A year in the life of Seren Winds wouldn’t be complete without some bizarre experience, so we accepted Classic FM’s invitation of doing a photoshoot on a chicken farm in Haverfordwest. A photo of Michael accompanied the story of farmers playing classical music to their chickens to increase productivity, which remarkably proved worthwhile! Our next stop after Haverfordwest was Morriston Hospital in Swansea, where our concert opened their annual music festival. We performed an hour programme in the busy main foyer, and patients were brought down from their wards to enjoy the live music. 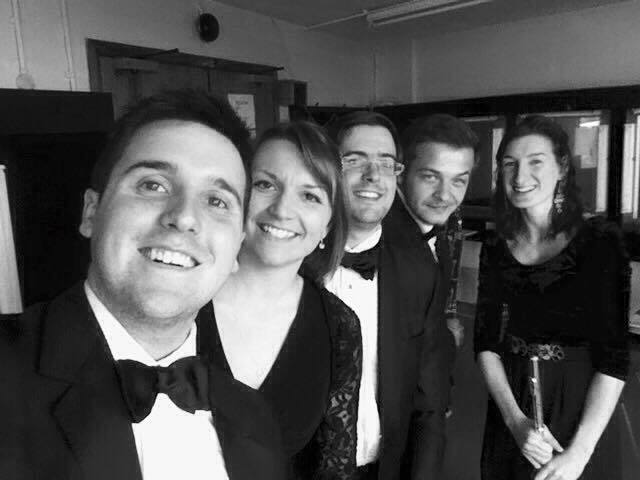 Aside from our work with Live Music Now, we continue to enjoy putting together fun and challenging recital programmes, and on Sunday 26th November we travelled up to Aberystwyth to perform for the music club. The concert was in a circular recital room in the university, with a rather unusual acoustic. We had fun working out where to position ourselves in relation to the centre of the room, but concluded that everyone in the audience was going to have a different experience of the concert depending on their distance from us and from the centre of the room. The concert went down a treat, some saying it was the best concert they’d heard in the music club! Our varied programme was well received; fast becoming our most popular favourite is Jean-Philippe Calvin’s Kleztet, of which we play the first movement, Gefilte Fish. Time to learn the other movements now… catch them in a 2018 recital! By Thursday 7th December Christmas was in full swing for us as we took a festive programme to Ty Hapus care home in Barry, where our music was very well received. We had positive feedback from the residents, who were in fine voice and alighting their festive spirit with some rhythmic percussion playing and conducting along! Following that we were joined by Katherine from the LMN Wales office team for the Crossroads Christmas party in Penarth, where we played an array of carols with Katherine leading the singing. Even after a busy year we still had a first in December when we played for a wedding. Many congratulations to Zoe and Patrick, who tied the knot in an art gallery at the National Museum in Cardiff on Saturday 9th December. We were privileged to play as Zoe walked down the aisle, for the signing of the register, and the wedding party exit, and then provided a couple of sets of background music during the drinks reception and meal. To round off the year we performed a selection of Christmas favourites in the reception and cafe area of Noah’s Ark Children’s Hospital in Cardiff on 14th December. Sadly Bart was unable to join us on this occasion, so lots of quartet arranging ensued! It was a lovely atmosphere and one girl enjoyed it so much she pulled up a chair for a front row seat. In summary, what a year! We are so thankful and fortunate to be able to do what we love and continue performing live music to such diverse audiences. Here’s to more adventures in 2018! Posted in Uncategorized on December 23, 2017 by Seren Winds. Live Music Now is a UK-wide initiative, created by Yehudi Menuhin and Ian Stoutzker in 1977. Every year, our musicians deliver thousands of interactive music programmes in care homes and hospitals, and a range of community and healthcare settings. We also work in special schools, where music can make a huge difference to the lives of children and their families. Our specialist support and training provides young musicians with skills and employment at the start of their professional careers, across all genres of music. It is a privilege to be part of the scheme and we are all very excited and looking forward to new performance experiences and challenges. Training will be happening over the next few months, and we’ll be sure to keep you updated with any public performances which are offered to us. Posted in Uncategorized on April 18, 2017 by Seren Winds. After much planning and preparation, we recorded our debut album in the Dora Stoutzker Hall at the end of July. We had two days of recording booked in, and are grateful to Joshua Goodey who was our very patient sound engineer for the whole process. The disk is just over an hour long and includes the ever-popular Farkas Hungarian Dances, Taffanel’s Wind Quintet, one of our firm favourites Poulenc’s Novelette in C, and Damase’s 17 Variations. It is safe to say it was a very hard working couple of days (as Katie pointed out in a recent recital, we probably had recorded Damase’s 117 variations by the end of it), but definitely all worth it when we heard the results. The hall is an excellent acoustic, and a perfect space to record chamber music. We were honoured to receive a watercolour painting of us from Colin Bishop when we did our recital in Rhiwbina in April, and it was the perfect image to use as the album cover. The background is also used for the artwork on the CD itself, and our regular ‘blue’ quintet colour scheme fits in perfectly. We are extremely grateful to Peter Lower, Katie’s brother, who designed the album artwork for us. If you would like to purchase a copy of our CD please visit the ‘Recordings & Media’ section of our website or email us on hello@serenwinds.co.uk. They cost £10 plus postage and packing. Posted in Uncategorized on November 5, 2016 by Seren Winds. A busy quintet summer and autumn! It’s been a pretty busy few months for our quintet! In July we had the privilege to perform as part of the Three Choirs Festival in Hereford Cathedral and then jumped straight onto a plane to Quiberon, performing as part of the warm-up for Pascal Gallois’ new music festival, Les Musicales de Quiberon. We were thrilled to hear that Pascal’s festival weekend in September was a great success! With the new academic year, Eric and Michael returned to RWCMD – but we still had some work to do, and in September we performed at the VIP champagne reception of BAFTA Cymru in St David’s Hall. It was fantastic to see so many respected artists there and we loved playing as everyone arrived. Backstage in our BAFTA dressing room! It also gave us a chance to try out some new arrangements (especially ABBA!) 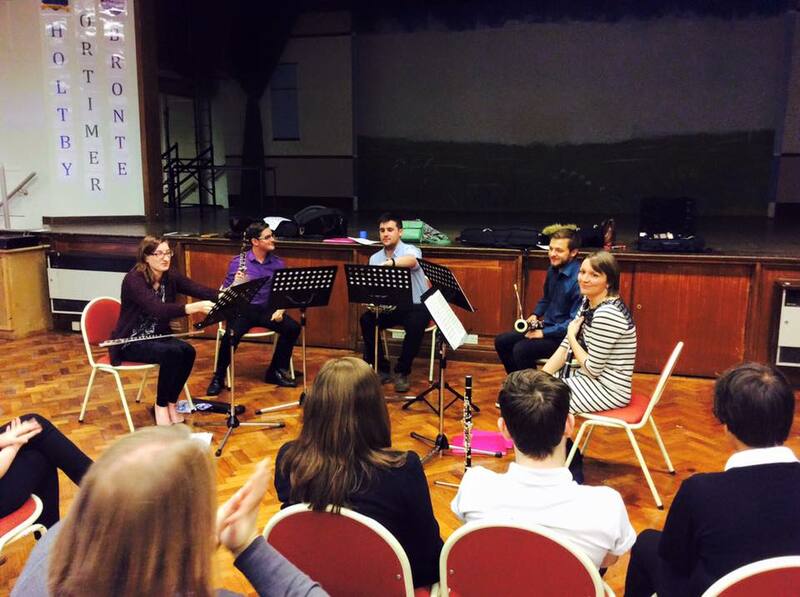 and some of June Emerson Wind Music’s arrangements – Rossini’s Silken Ladder Overture is a particular favourite! When we’re not hob-nobbing with film and television stars, we also perform educational concerts in schools. 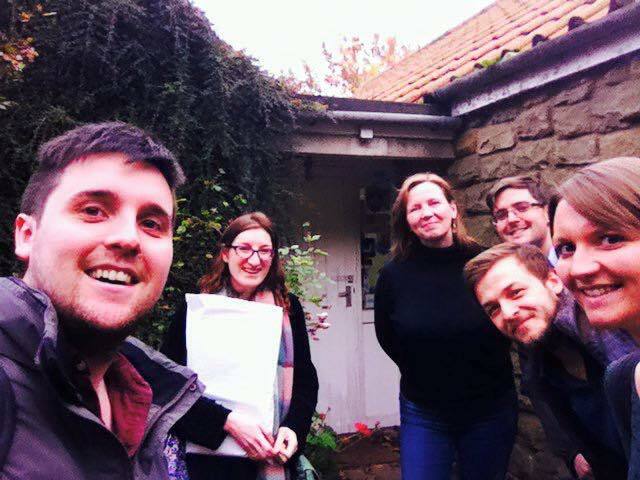 In September and October we’ve played our quintet version of Hansel & Gretel (also provided by June Emerson Wind Music) to children in Llandaff Cathedral School, Driffield Junior School and Driffield School, as well as some give-it-a-go sessions with instruments. 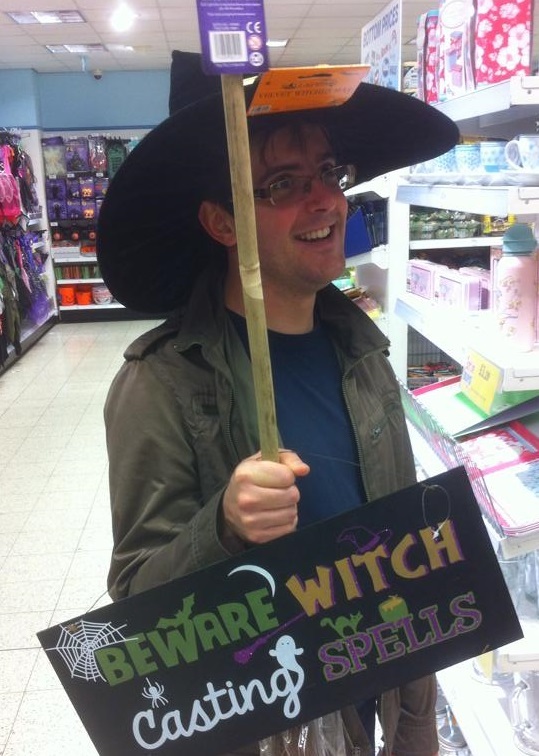 It was fantastic to hear that many of the children were inspired to take up lessons after hearing us, and with a running time of 30 minutes as well as some outstanding acting from our resident Wicked Witch, Eric, this education project is proving a great success for schools. Coming up we have a recital in Cardiff Museum on Sunday 8th November at 1pm, and we are hoping to record a CD in the next few months as promotional material. We are also thrilled to announce that our bassoonist, Bartosz Kwasecki, has won a place in the Southbank Sinfonia this year! This is a huge and well-deserved achievement; congratulations Bart! As part of our launchpad prize from June Emerson Wind Music we won £150 worth of vouchers to spend on music and the opportunity to visit the shop and try out anything and everything that was on the shelf! We arranged to visit one Sunday in October and after a wonderful lunch at the local pub (many thanks to Rachel and Stewart!) we spent a few hours browsing the shelves and playing through a very large pile of music. We can’t wait to get started on rehearsing new rep and programming it in future recitals. Amongst this recital repertoire, we also came away with various children’s music (see the Educational Projects blog). Quintet selfie with Rachel Emerson. As well as the visit to June Emerson, our musical excursions included visits to schools in Driffield, where we were staying with Laura’s parents, and busking in Beverley (though sadly rain stopped play after 45 minutes). Non-musical excursions included a trip to Bridlington for fish and chips and a walk along the sea front, celebratory drinks in Driffield for Bart’s recent Southbank Sinfonia success, and much frustration playing the London Board Game. If you’ve not played it, you should! September 29th saw the premiere of Seren Winds’ version of ‘Hansel and Gretel’, an arrangement by Helen Mills of Humperdinck’s opera. All of the well-loved tunes from the opera are arranged and interspersed with narration of the story. Initially, we intended to narrate it as one person though when it came to putting it together in rehearsals we found that it would work well being acted out too. After some tweaking of the script and charity shop costume and prop shopping we staged it at The Cathedral School Llandaf, who had booked us for educational concerts for the Infant and the junior school children. It was popular with all and the large show of hands indicating who would like to learn an instrument proved that it we inspired quite a few budding young musicians. Our second performance, for the Junior school, ended with a try-it-out session, where we each had queues of children wanting to discover which woodwind instrument is right for them. There was much natural talent amongst the pupils, which is helpfully being followed up by the school to get started on their musical journey. Not only is it immensely fun (in our opinion), there is much research which proves links between academic performance and music, as musical training optimises brain function, and we are thrilled to have the opportunity to inspire the next generation of musicians. Following the success of these performances, we also offered ‘Hansel and Gretel’ to Driffield Junior School who gladly invited us to perform in a whole school assembly. This also went down very well, with audience feedback including ‘mind-blowing’, ‘amazing’, ‘fabulous’, ‘supercalafragilisticexpialidocious’, and one girl, when asked to describe the performance, was literally speechless. 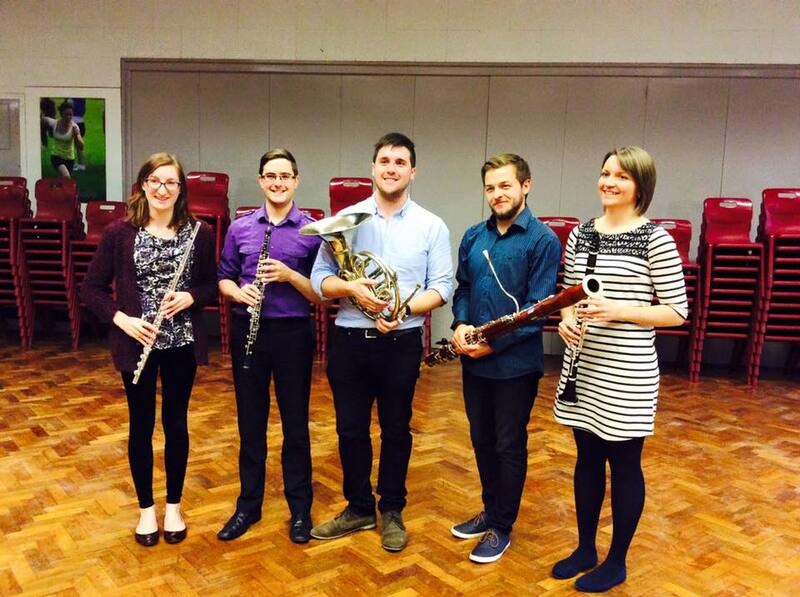 We then went to Driffield School to work with the GCSE students, performing to them and passing on knowledge about how best to compose and arrange for wind instruments. Performing to students at Driffield School in October. Our time at the school also included a workshop with the woodwind students, many of whom had never played in an ensemble before and so we formed a large ensemble with them, playing a couple of well-known orchestral tunes alongside them before ending with a short recital to a packed school hall. As a quintet we are looking forward to more projects of a similar nature. Prokofiev’s Peter and the Wolf is being arranged for us, and we invested in ‘Winnie the Pooh Suite’, ’Pooh Two’, ‘The Unhappy Aardvark’ and ‘A Tale of Five Winds – A Story for Christmas’ with our prize money from June Emerson. If you are interested in educational projects for your school, or any other setting please get in touch via hello@serenwinds.co.uk. 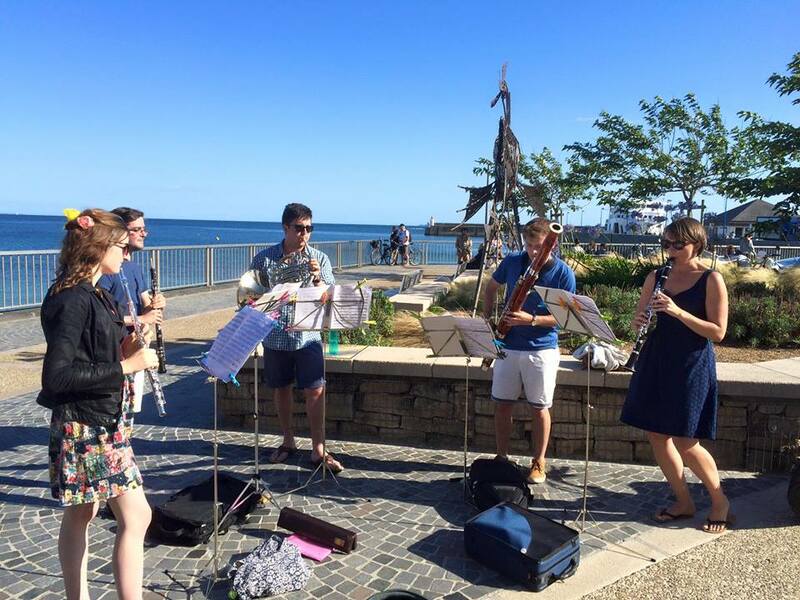 It’s fair to say that Seren Winds can be justifiably proud that having only played together since January, we were invited to be a ‘teaser act’ for a new music festival in Quiberon, a small peninsula off Brittany in Northern France. Pascal Gallois, the renowned bassoonist, invited us to perform in the town as part of the build up to his new ‘Musicales de Quiberon’ festival on the 19th-20th September, which involves performances of works by Schoenberg, Mahler, Varese, Kurtag and Boulez with the International Contemporary Ensemble of New York. The trip itself was a fantastic opportunity for us, improving our ensemble playing dramatically and being tremendous fun. We flew from London City Airport early on the Tuesday morning and landed in disappointingly rainy and cold Quimper, to be met by Pascal and taken to our house on the southern side of the peninsula (or ‘isthmus’ as Pascal rather more accurately referred to it, despite a charming inability to pronounce the word ‘isthmus’). The house made available to us during our stay was just off the beach and a couple of minutes’ walk from both a wonderful little restaurant bar and a surprisingly well-stocked little supermarket. Soon after arriving we were in the former, with Pascal buying us a lunch of mussels and Breton cider – both of which were delightful. The mussels were so delightful (and so plentiful), in fact, that it must have taken us at least an hour to work our way through all of them. With supreme effort of will we then managed to drag ourselves around the town to decide where we’d be performing throughout the week. At this point we should introduce Serge. Serge is the man in charge of finance in Quiberon (presumably with attendant title, but we couldn’t work out what that might be) and it was he, along with Sérine Barbin (the Culture Minister), who helped Pascal organise the festival. It would be an understatement to say that Serge is a man of few words; he’s a man of no words, instead preferring to use that sort of French throaty noise which could mean anything. He wore incredibly dark sunglasses for the majority of the time, so none of us actually saw his eyes for the first three days of our stay. He also had an endearing habit of taking different routes between the town centre and our house every time he drove us, which was at least twice a day. He would take random turnings whenever he fancied, as if it was a game to find the most interesting route home. 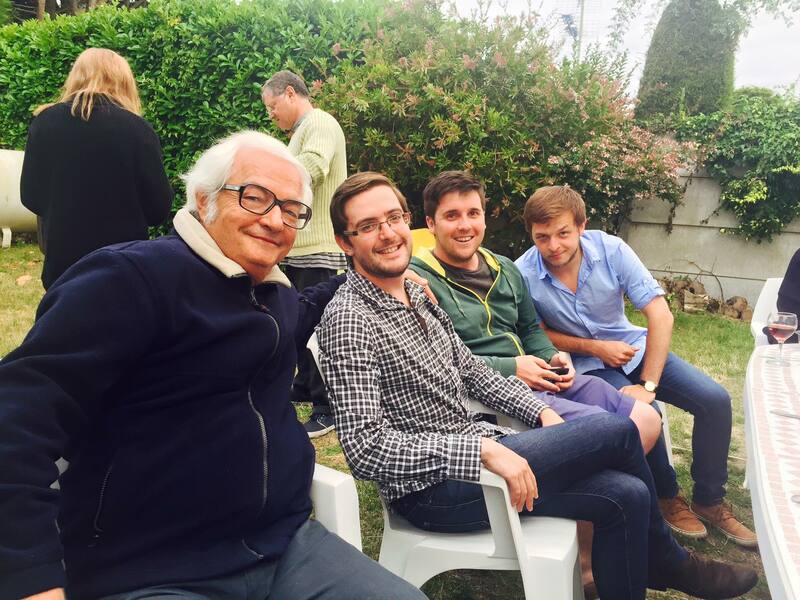 Serge, Eric, Michael and Bart at our leaving party. Pascal (not a resident of Quiberon) also tried this, taking several turns of a roundabout on one drive home, but this was because he was lost. On occasion we took the Quib’bus into or from town, a circular bus service that cost us 1€ each for the entire day (the bus itself wasn’t circular, obviously, the route was circular). Quiberon itself is a lovely seaside town, which looked far better in the sunshine we had throughout the week than in the rain on the first day. We found out from Pascal that we’d be performing three times a day (at 11am, 4pm and 6pm), each time in a different part of town, and that while we tootled away he’d hand out flyers and generally advertise his festival. Our first session each day was in a charming little square called ‘la Place Duchesse Anne’; the second in a place whose only relevant feature seemed to be a metal fish statue; and the third next to a pharmacy in the main square of the town. We would turn up at the relevant time, cover our stands with clothes pegs to stop a catastrophic loss of music due to the wind, and play a light programme for perhaps half an hour or until we got bored of the breeze prematurely turning pages for us. I’m quite sure that none of us wanted to see a clothes peg again at the end of each day, and it certainly made performances slightly more challenging – in one Danzi quintet I missed most of a page while wrestling with my pegs, and Eric played much of the last section from memory after the wind blew another page over the music we were playing. Aside from these performances our time was our own and most often we’d head back to our house with the intention to rehearse but would end up on the beach or in the restaurant for lunch. Between the afternoon concerts we’d find a seaside café for an ice cream or crepe (or, admittedly, a bottle of wine). The busy performing schedule allowed us to expand our repertoire, and in particular we found some of the June Emerson string quartet-wind quintet arrangements (Haydn and Mozart) both sight-readable and popular with the audience, who generally stopped to listen and chuck a Euro or two into our strategically placed instrument case. Having prepared for one or two formal recitals we had works such as Françaix and Nielsen quintets but these proved to be slightly too avant-garde for the holidaying audience. Another piece that we played a lot was Farkas’ Early Hungarian Dances, which we’d decided to take at the last minute. Not only was it popular with the families who stopped to let their children indulge in some interpretative dance, it was hugely popular with Pascal and Serge, who requested it at every opportunity. I think we played at least one movement of Farkas in almost all of the eighteen performances we gave. 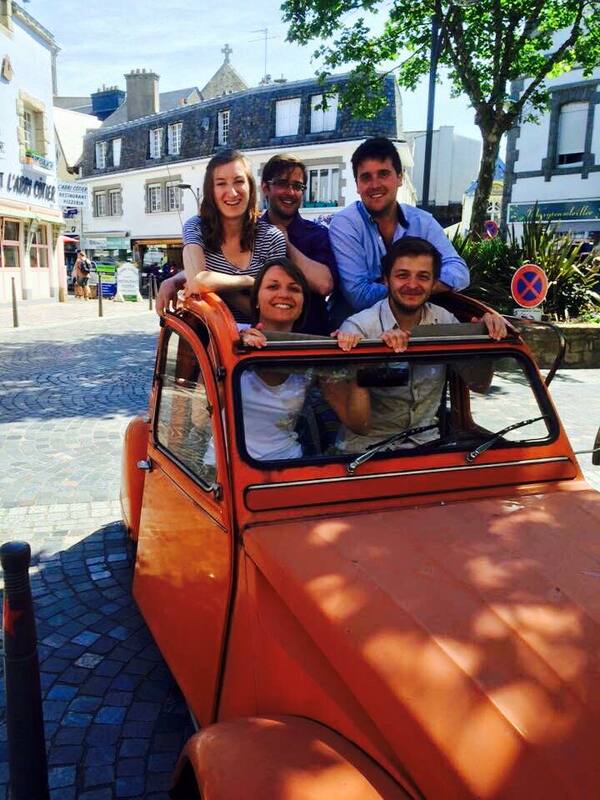 One such rendition took place in an extremely old Citroën that Pascal had arranged for us to use. At first we had no idea what he was saying when he introduced it as a ‘deux chevaux’ but it seems that a ‘Citroën Two Horses’ is a well-known French icon. Somehow we all crammed into this tiny orange car and just about got through the first movement of Farkas – from memory and trying not to collapse into hysterics. It drew quite a crowd, however, and there is a video available on our Facebook page (www.facebook.com/SerenWinds) for anyone who wants to inject some surrealism into their day. Aside from the many performances the trip was also a great opportunity to meet locals and music lovers from the area. Many passersby stopped passing by in order to thank us, including a clarinet fanatic who hovered over Laura’s shoulder for quite some time, a bassoon fan who donated 10€ because he liked Bart’s staccato playing, and a horn in the Bordeaux Opera who handed me 2€ after a performance of some Gounod in which I’d temporarily forgotten how to transpose. There were two ‘parties’ for us. The first was in a large garden just outside the town centre, where we were plied with whiskey, wine, beer, Porto, Grappa, some bizarre-smelling Framboise liqueur, Calvados, Cognac, cheese, meat and a variety of other apéritifs that I can’t remember before playing a miniature recital on the patio, which was received with great delight by the private audience. I was cautious about possible noise complaints if we played the fourth movement of the Françaix quintet, but then our host ambled up with several cans of Heineken and we all became much less concerned. On our last night in Quiberon guests came to our house for another party, this time involving a barbecue and copious amounts of French red wine. A strong sea breeze made lighting the barbecue a bit of a challenge but Pascal had a trick for this. While I was prodding some coal and firelighters around he wandered up with a hairdryer and started blasting the coals with hot air, managing to simultaneously endanger nearby hedges while getting the barbecue, and the party, really going. Many thanks are owed to Pascal Gallois, Serge Brosolo and Sérine Barbin for inviting us to Quiberon and for making our week extremely enjoyable, and we very much hope to be back in 2016! Thanks also to June Emerson Wind Music, who provided us with some of the most popular arrangements of the trip.